Modern cities are complex systems with multiscale temporal processes in their core: whether it is commuters activity or the working hours of venues. In order to understand and manage such processes we need a radically new approach for their analysis. Habidatum’s CTO and Data Science Lead explain the theory and technology behind Chronotope, why spatio-temporal analysis is important, and the types of data that are being used to navigate the hyper-dynamic urban environment. We will first take a look at different examples of data used as the basis of Habidatum projects in Moscow, London, Dubai and later will explore the patterns of human behaviour in your city based the best available local datasets. 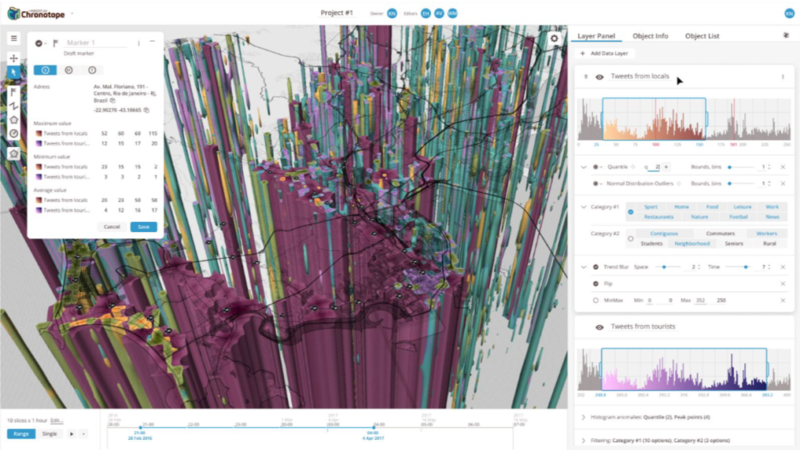 This intro will allow you to discover Chronotope — a platform developed by Habidatum for analysis, visualisation and processing of spatio-temporal data from a variety of sources, giving you the ability to locate and explore patterns and correlations in 3D. Habidatum is an international software and data analytics company. We assist policy makers and businesses in understanding the hyper-dynamic urban environment through advanced analysis of spontaneous data. We operate as a gateway between the professional communities requiring data-driven insights, and the data carriers such as mobile network operators, social media platforms, financial and insurance institutions, or commercial property managers. From our founding in 2014, we’ve been working with data aggregation, visualization and analytical interpretations in projects globally which led us to the development of our solutions including Chronotope software for analytical visualization of spatio-temporal data accessible through browser; data marketplace through which the aggregated data layers from our partners and customers become available to the data analytics market; and tailor-made analytical packages (we call them synthetic metrics) for a range of industries, from urban planning to insurance.